Eight hundred goats, 535 hectares of land and 72 Nguni cattle are all part of the dream Lerato Senakhomo is living. The 26-year-old from Nigel, in the east of Gauteng, received land from the Department of Rural Development and Land Reform. Her family moved from the nearby township and started farming sheep and producing dairy products in 2006 on two hectares of land. 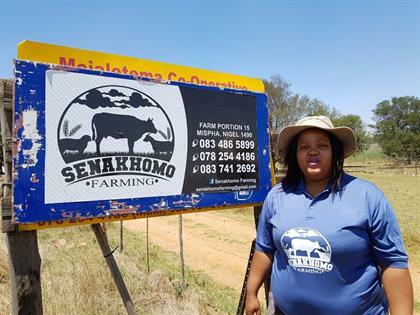 Senakhomo took over in 2012 after undergoing agricultural training from Buhle Farmer's Academy and Grain South Africa, she then registered Senakhomo Farming. In 2016, her family received 535 hectares from the government and they have gone from strength to strength. "It wasn't an easy term. I had to take loans and talk to my parents to raise funds for me to start and for me to be where I am today," Senakhomo told News24. She works with goats, sheep, cattle, horses and chickens; and also plants white and yellow maize and sugar beans on 100 hectares. In 2017 she was honoured with a Gauteng Department of Agriculture, Forestry and Fisheries Female Entrepreneur Award.